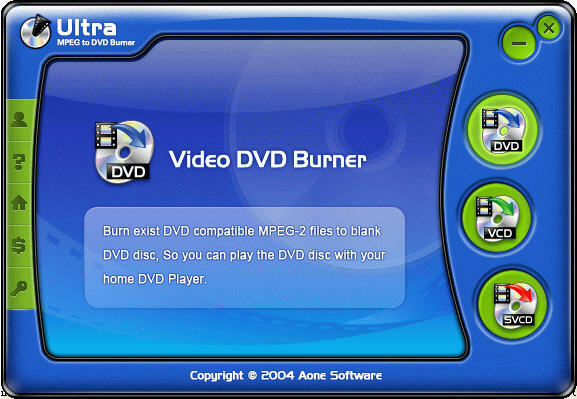 Ultra MPEG to DVD Burner is a powerful and handy tool to burn video DVD VCD SVCD disc from existing DVD VCD SVCD compatible MPEG files which has been converted using your video converting tools, So you can play movies on your home DVD Player. Allok Video to DVD Burner is an easy and professional Video to DVD burner that lets you convert all favorite movies to DVD movies and burning it onto DVD Disc, and then watch them on home DVD Player ,car DVD Player or any other portable DVD Player. A powerful, easy-to-use and fast video converter which can burn AVI to DVD, MEPG to DVD, and other video format to DVD VCD, such as rm, wmv, mov, asf, etc. Cucusoft Mpeg/Mov/RMVB/DivX/AVI to DVD/VCD/SVCD Converter Pro" is easy to use and powerful for experts as well. It enables you to convert and burn any video file directly to VCD, DVD, SVCD, MPEG1 and MPEG2 format. Not only will it burn your music in the order you want it, but it will let you edit each song to get rid of silence, extra long applauses or fade in and out incomplete songs.